Apprenticeship starts for March are down 52 per cent compared with the same period in 2017. 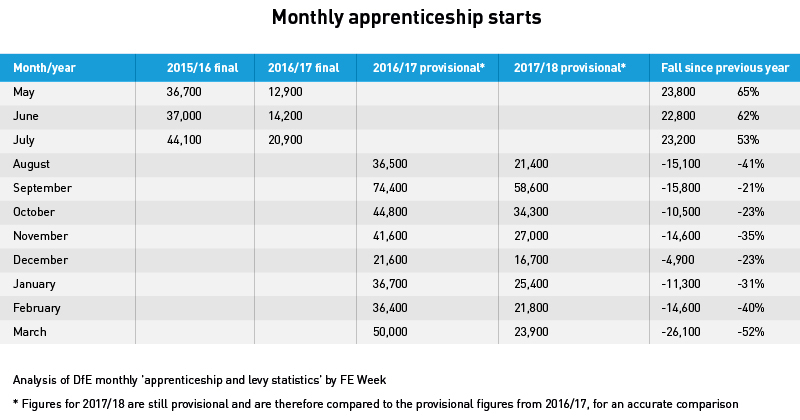 There have been 23,900 starts recorded so far in March 2018, compared with 50,000 in March 2017 according to the Education and Skills Funding Agency’s monthly apprenticeship statistics update, published this morning. Overall starts for the year to date stand at 261,200, compared with 362,400 for the same period in 2016/17 – a fall of 28 per cent. That means the government is now 230,300 or 17 per cent off the 3m trajectory. Today’s figures come the day after the government went on the defensive over the apprenticeship levy. An open letter signed by skills minister Anne Milton, Institute for Apprenticeships boss Sir Gerry Berragan and dozens of senior figures from business schools, businesses and other organisations urged the sector to “support employers in making use of the levy”. Other signatories to the letter include Euan Blair, the son of former prime minister Tony Blair and co-founder of apprenticeship agency WhiteHat, and leaders from businesses including Airbus, Barclays, Siemens and Aston Martin. Mark Dawe, boss of the Association of Employment and Learning Providers, said he understood why the skills minister had gone on the defensive – and that the AELP also “strongly supports” the levy. “But we hope that when she addresses the AELP conference in a few days’ time, she will signal a suspension of charging SMEs for apprenticeships for 16-24 year olds at levels two and three,” he said. “With the government showing no intention of abandoning its 3 million target, start numbers are now so far behind the curve, action has to be take now to reverse the falls. Gordon Marsden, shadow skills minister, said the figures were “further damning evidence of the deep concerns” from many across the sector. “Government must get a grip on the starts fiasco and the concerns about the levy rapidly. Otherwise they will jeopardise the huge life chances apprenticeships offer young people and also the long term prosperity of our economy,” he said. “The government will claim quality is rising, but we think it’s far too early to say that. Critics will say the levy isn’t working, but we’re clear it was the right move,” said Stephen Evans, chief executive of the Learning and Work Institute. “Changes are needed to make apprenticeships work better. But this should be about reforming the current system, not ripping it up,” he said. 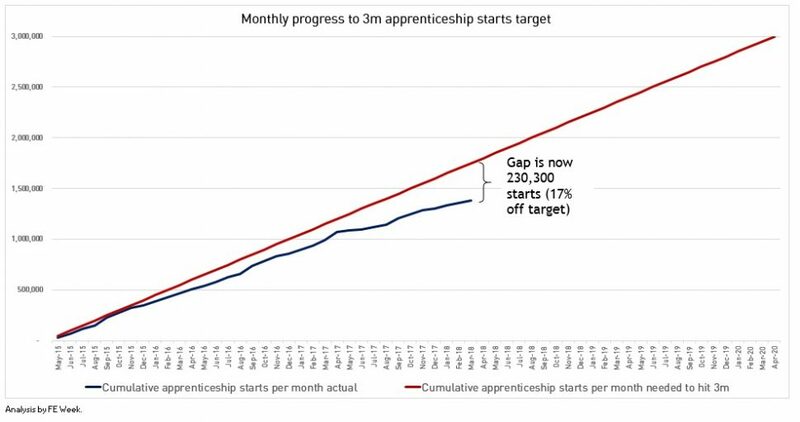 According to the commentary that went alongside today’s figures, “care should be taken when comparing individual months with previous years as they are unlikely to provide a meaningful year on year trend” as the “profile of apprenticeship starts changed significantly in the run up to the introduction of the levy and beyond”. “This is especially the case when trying to compare starts in March 2018 to starts in March 2017, as there was an unusually large increase in starts in March (and April) 2017 ahead of the introduction of the apprenticeship levy, and then an unusually large decrease in starts in May 2017 when compared to previous years,” it said. When I went to the careers evening at my daughters ‘outstanding’ school this time last year the word ‘apprenticeship’ was not used once. Everyone there to talk were from HE institutions. The school sent a questionnaire to track the progression of leavers that avoided the use of the NEET category for those who did not go onto HE or into a job, instead parents were invited to say their offspring were taking a ‘gap year’. Ofsted need to stop skimming the surface when it comes to inspection and make such schools accountable for their failures. Of course when this school is finally inspected the parents and pupils who could really comment on this aspect will not be included. Around 20 very bright young people from last year decided not to go to ‘Uni’ and the majority are working in retail without any training still deciding on their futures. Two became apprentices and have clear career plans, based totally on their own research and aptitude. Sadly, many of those who went to Uni could have gone into apprenticeships and learnt the knowledge and skills required in the workplace rather than on a campus removed from real life. This pattern is clearly being repeated across England and needs to be challenged by having real and independent careers advice.